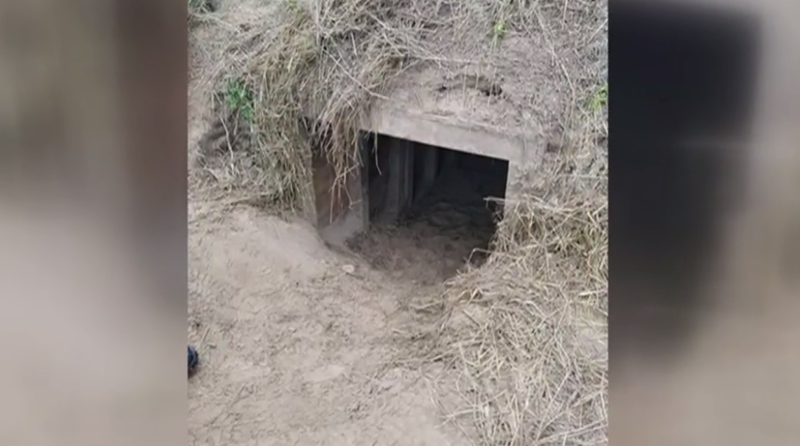 Border Patrol agents in Texas found a surprise during a patrol: another tunnel on the U.S.-Mexico border that would run along property proposed for a portion of President Donald Trump's proposed wall. The tunnel, located outside of Hidalgo, Texas, is near a portion of the border wall put up about 10 years ago, the Rio Grande Guardian news service reports. Additionally, the tunnel begins at the bottom of a 30-foot embankment on the Rio Grande and is impossible to see unless you are on the river. The tunnel, which was still being constructed at the time it was discovered, is about 1,500 feet downriver from the Hidalgo County Water Improvement District No. 3 pump station. "You've seen them on the news in Arizona and New Mexico and stuff like that, but I’ve never seen one in the [Rio Grande Valley]. That's the first one I’ve seen in our backyard,” Hidalgo County Water Improvement District (HCWID) No. 3 General Manager Othal Brand Jr. told KRGV TV. The tunnel is about 60 feet in length, and Brand said he thought it was going to a nearby sports rental business. "Our suspicion is they were going to come up in one of these rental units and store their stuff there and just pick it up when they want. They were deep enough to go under that wall without any problem," Brand told the Rio Grande Guardian. The construction of the tunnel impressed Brand, who said that it was fortified with 4-by-4's and plywood on the top and the sides. Even building the tunnel was an astounding achievement, Brand said, due to the soft sand on the embankment. Brand said that he has assisted the Border Patrol before, providing equipment it doesn't have, but it's too dangerous to use machinery to reach the tunnel and pull it down. Instead, a company will place explosives and demolish the tunnel in the next couple of weeks, the Rio Grande Guardian said. State lawmakers toured the area last week, and their itinerary included a tour of the pump station. However, HCWID No. 3 employees noticed drug runners on the other side of the border a few hours before legislators were set to arrive, prompting the tour's cancellation. Brand said that instances like that also mean employees should leave the area for their own safety, as the pump station's boat ramp is the easiest place in the area for drug runners to cross into the U.S. While the runners did not utilize the boat ramp that day, Brand told the Rio Grande Guardian that he wished the lawmakers could have seen them and perhaps understood what he and his employees experience every day. The Texas tunnel isn't the first instance of individuals digging under the wall or the border to gain entry into the United States. Earlier this month, over 600 migrants entered the country through tunnels dug under sections of the border wall in Arizona and New Mexico. Largest Single Group of Asylum Seekers Reaches U.S.